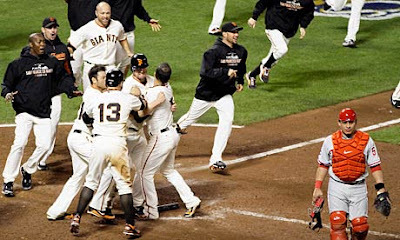 The San Francisco Giant beat the Texas Rangers in a tense Game 5 on Monday. They last crowned in 1954. After 56 Years the Giant win the World Series. It was the pitching staff of Giants, led in Game 5 by two-time Cy Young winner Tim Lincecum. Edgar Renteria was MVP of the series and hero of the night. He hit a two-out, three-run homer off Rangers ace Cliff Lee to break up a scoreless duel. Texas became the latest Series newcomer to make a quick exit. Houston in 2005 and Colorado in 2007 got swept in their first appearances, Tampa Bay in 2008 stuck around for just five games.